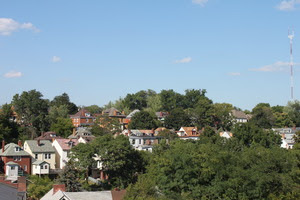 Located on the Pittsburgh’s northern edge between Riverview Park and the East Street Valley, Observatory Hill features large, stately homes on Perrysville and equally charming modest homes that border the park and wind between Perrysville and Marshall Avenues. Neighbors will swing their doors open as visitors step from the Molly’s Trolleys that stop at convenient intersections. Guests will see that this green and friendly community is on the move with homes, parks and community assets that reward visitors who make the trip up to the Observatory Hill House Tour on Sunday, June 7th. Don’t miss the architectural details that will have you ‘looking up’ for color and inspiration all afternoon. Tickets are available for $15.00 at the registration table at Riverview United Presbyterian Church at 3505 Perrysville Avenue.